It's Official. Meet Ms. Frizzle. Because we just needed a little more excitement in our lives. Meet the newest member of the Shifley family. Hi, I'm a cute puppy who likes to get up at 4:30 in the morning. Yay me!! 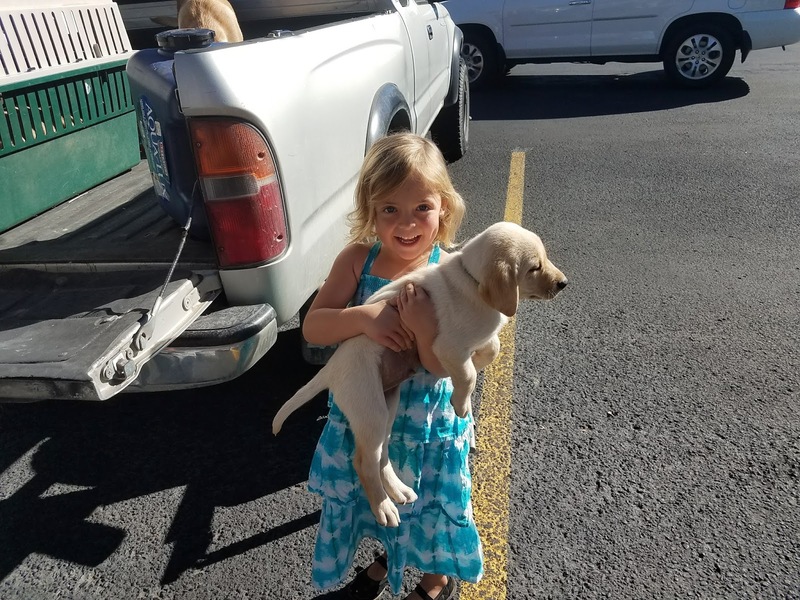 Ms. Frizzle is an 8-week-old yellow lab. If you're familiar with the cartoon "The Magic School Bus" then you know where the name came from. If you're not familiar then consider yourself lucky. It's a really weird cartoon. Mrs. Shife and I weren't sold on the name, but the kiddos won us over. And I still chuckle to myself when I think about having a dog named Frizzle. Anyway, we have had her almost a week and everyone is pretty happy about it except you know who. Tank Tank does not approve. 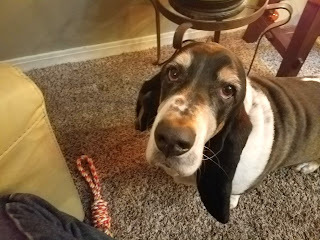 Extra sad basset face. Who am I kidding ... it's always extra sad. But he seems to be coming around as he was actually playing with her yesterday evening. Bring me your finest meats and cheeses or I will jump. Abby tells Tank to hangeth in there! Aw, look at that face! And aw, look at that other face (Tank's)! I hope they end up liking each other. I've heard that a younger dog can take years off an older one. By which I mean the older one gets more playful and acts younger. Your kids look thrilled! Tank probably feels a bit jealous but he and Fizzle will end up great friends, who couldn't love a yellow lab. The photographs are GREAT, Mat ... you're a lucky man having two lovely kids and two lovely dogs. I am, of course, just a tad jealous! When we got our dog earlier in the year, my wife wanted a lab, yet somehow we ended up with a Yorkie. Tank will get over it. You sure do like an adventure, don't you? 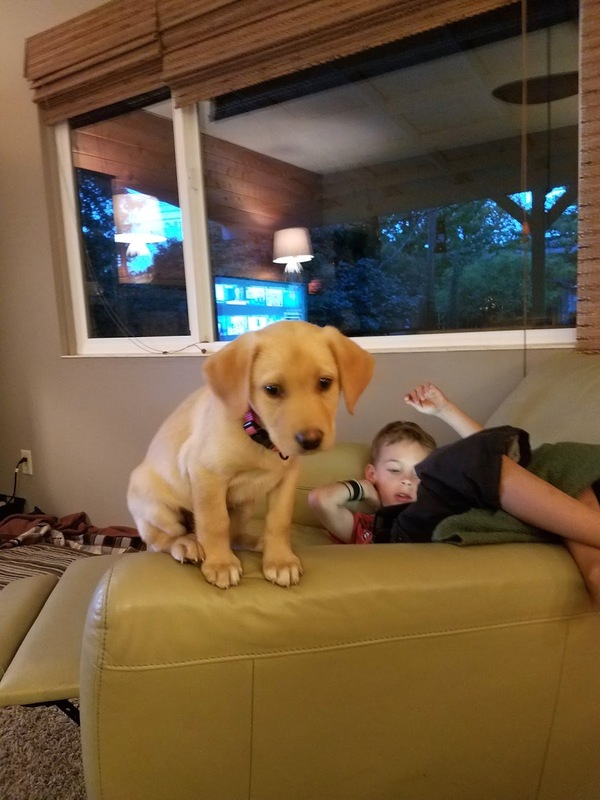 A new puppy will ensure you hours and hours of fun! beautiful dog. you can never go wrong with a lab. my favorite two dogs were black lab / shepherd crosses. you're going to be very busy for the next 6 months. My wife recently rescued a yellow Lab. I think she named it Buttercup, but I call her Corn Dog. My Basset Hound is very jealous of the new dog.